Sticking pins on a very simple bag and charging £590.00 for it? um I don't think so. The pins are quiet pretty and colourful, but I don't feel the same way about the bag. "A small black leather bag with safety pin embellishment. Long adjustable shoulder strap with a silver metal buckle. 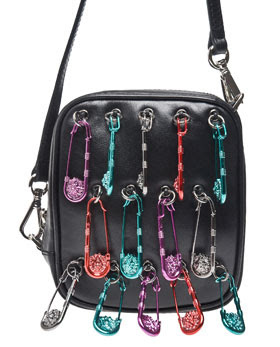 Various colour safety pins with a lions’ head detail attach to the bag with silver metal loops and eyelets. Zip fastening main compartment. Black fabric lined interior with one patch pocket. Removable shoulder strap attaches on the diagonal corners with silver metal dog clips. Transform your urban outfit with Versus’ Mini Shoulder Bag with Safety Pins. Wear across the body over a khaki jacket and cropped trousers for summer style."